Posted by Teresa Mihelic HelpDesk on Tuesday, October 9th, 2012 at 12:09pm. Are you looking for something to do this next Sunday in Dana Point? Well. We are always encouraging clients interested in beach close homes in Orange County, to check out Dana Point and what the city has to offer. Every beach city in Orange County is wonderful, but somehow we feel Dana Point doesn't get enough attention ( maybe is because it is in fact smaller than the others). The city is always hosting some event, and if you are looking for homes in Dana Point with the idea of getting busy socially or be active within the community, this might be the right town for you. 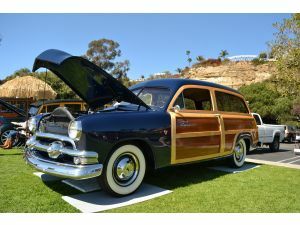 This next Sunday, The Southern California Woodie Club will present Octoberwood, a display of classic wood-paneled cars, from 8 a.m. to 3 p.m. Sunday October 14th at Lantern Bay Park, 25111 Park Lantern Road, Dana Point. This will be a small exhibit of the famous surf mobiles of all time otherwise known as the "Woodies." This beautiful restored classics not only are very 'cool' itselfs, but they also show cast the personal touches of the owners. The free event will include surf vendors, food, drink and music. The Lantern Bay Park is the one located in front of the Marriott's Laguna Cliffs Resort and parking might be a little tricky. So here's an idea. Enjoy Dana Point and all that it has to offer: drive Golden Lantern all the west, where it hits PCH. You'll be at the Dana Point Harbor. Not only parking is free there, you get to explore all of what the Harbor has to offer. And do a little walk on a trail located on the right side of Crown Valley if you are facing from the Harbor ( on the Lantern Bay Park's side), that will take you to the Park, and the Woody Exhibit. Not only you get the enjoy the show, but being there is a show itself: the views of the Harbor, and all the way to San Diego and the coast are breathtaking. Enjoy your Sunday! And if you feel it's time to tour Dana Point Homes for sale, let us know. Interested in what homes in Dana Point will have those phenomenal Ocean Views? Let us help you find them! We are ready when you are!